It might seem like a really obvious statement but this album is all about the songs. What it isn’t about is overblown production techniques, flashy solos or drums like cannons. It’s a group of musicians playing live in the studio, trying to get to the heart of eleven songs without bludgeoning the songs into submission. Danny Schmidt is a songwriter from Austin, Texas who fits perfectly into the seventies singer-songwriter mould (often used as a lazy comparison, but this time it’s absolutely spot on) with hints of Leonard Cohen, Neil Young and perhaps even Jackson Browne. On “Owls” (his seventh studio album), his band of Mike Meadows (drums), Andrew Pressman (bass), David Goodrich (electric guitars), Lloyd Maines (lap steel) and Carrie Elkins and Daniel Thomas Phipps (backing vocals) provide a backdrop that ranges from the ethereal, Mexican-accented “Girl with Lantern Eyes” through the Dylan-era Band of “The Guns and the Crazy Ones” to the moody, foreboding and doom-laden “Paper Cranes”. There’s even a bit of a rock ‘n’ roll flavour to the environmental anthem “Soon the Earth Shall Swallow”. 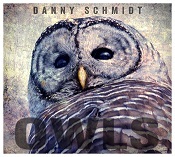 Lyrically, “Owls” is an album that’s worth digging into because not everything reveals itself at the first listen; Danny Schmidt makes extensive use of parable, metaphor and intricate rhyming schemes in his quest to convey his insights, which range from the political concerns of “The Guns and the Crazy Ones” and “Soon the Earth will Swallow” to the very personal “Girl with Lantern Eyes” and “Cry on the Flowers”. These songs will make you sad and make you angry; they might even make you think. And this is where we get to the really subjective bit. While Danny’s fragile tenor works really well most of the time, conveying emotion and fragility, there are times when the vibrato becomes a distraction from rather than an enhancement to the song. I know some of you might like this, and I’m not saying you’re wrong, but it’s a bit overdone for my taste. Otherwise it’s a bunch of great songs on interesting lyrical themes played tastefully by a great band providing frameworks which enhance the power of the songs. Out Monday May 18 on Live Once Records (LORCD09).